RETAIL - I stumbled upon this true retail gem whilst in the British seaside city of Brighton. 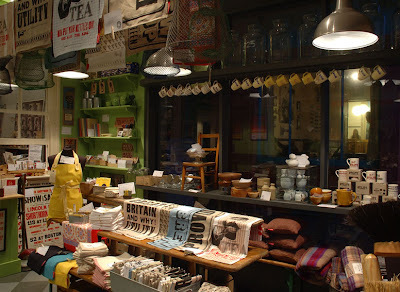 The inspiration behind this retailer's concept is from the World War 2 directive that demanded goods were produced with a minimum of wastage, due to a shortage of raw materials. Utility only stocks products that embody this philosophy, in addition they must be functional and hard-wearing. Now, more than ever this attitude towards products should/will be appealing to the average consumer. When we stopped by Utility we loved the space and products. The store stocks household goods that are made by small, family-run businesses. In addition to the products curated by the Utility team they have also created their own range of tea towels, aprons and mugs, which are an aesthetic delight. The guys behind the store describe themselves as 'self confessed font freaks' and we like that a lot!